LAN have today commenced their dedicated 787 service to Auckland and Sydney. 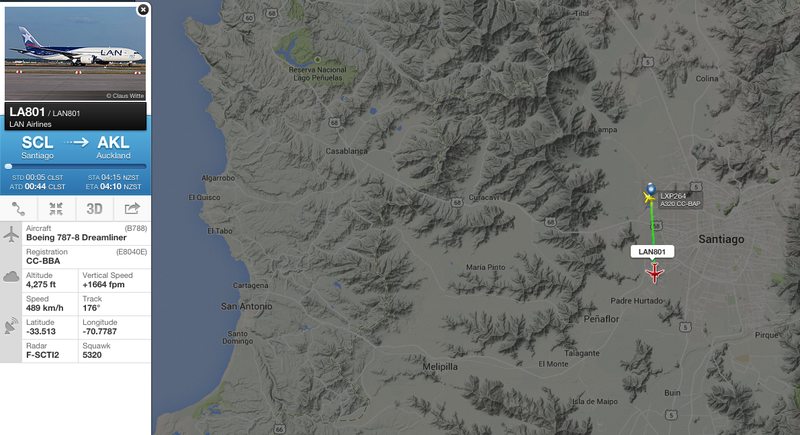 LA801 operated by Boeing 787-8 CC-BBA departed Santiago 39 minutes late at 00:44CLST Friday 17-April-2015 bound for Auckland and onto Sydney. The final A330 service on the route was operated by A330 CC-CQF as LA800 and departed Sydney at 10:17AEST Friday 17-April-2015 bound for Auckland and onto Santiago. Qantas will return to the PER-SIN route, this time with a 737-800 service. Flights will resume on Friday 26-June-2015 which will be just over a year since they axed their former PER-SIN A330 service. The newest domestic configured Airbus A320 for Air New Zealand ZK-OXI arrived into Christchurch from Cairns as NZ6097 on delivery in the early hours of Wednesday 15-April-2015. 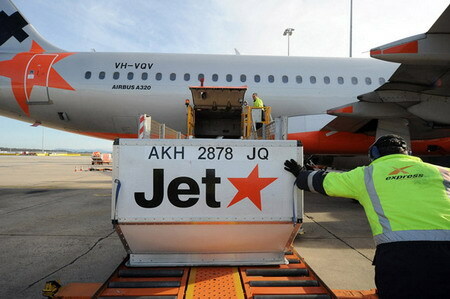 Jetstar's New Zealand operations have taken another publicity hit after issues with the baggage loading system in Wellington on Wednesday 08-April-2015. Passengers on VH-VQA JQ290 CHC-WLG were the worst effected with their baggage remaining on the aircraft as it returned to Christchurch as JQ291 incidentally only delayed by 30 minutes. The baggage was then unloaded at Christchurch and was finally delivered to passengers today Thursday 09-April-2015. Passengers are quoted as saying no one at Jetstar knew what was going on, from staff at the airport to staff in the call centre. Passengers arriving in from the Gold Coast on JQ167 experienced delays of 2 hours getting their luggage with some having theirs delivered by courier five hours after landing. Flight Radar 24 shows A320 VH-VGI operating the return JQ168 WLG-OOL service was delayed by two hours as a result. VH-VGP operating JQ292 WLG-AKL was also delayed as result with the flight departing at 12:46NZST two and three quarters hours after its 09:05NZST scheduled departure time. 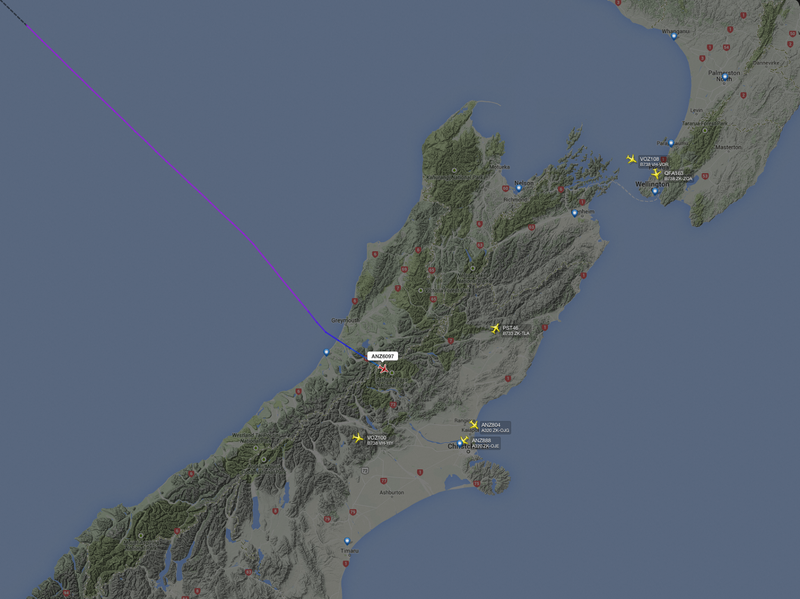 This resulted in JQ299 AKL-ZQN and JQ296 ZQN-AKL also operating 3 hours behind schedule. VH-VFI also experienced delays yesterday of 2 hours on JQ255/254/257/256 AKL-CHC-AKL-CHC-AKL these cannot be directly attributed to the baggage loading system in WLG although they may relate to crew being on one of the delayed flights from WLG. Read more on the baggage handling delay at WLG via stuff.co.nz HERE including the passenger complaints. Jetstar launched a raft of inaugural flights this week. On Sunday 29-March-2015 Cairns welcomed Jetstar's newest international route CNS-DPS-CNS with A320 VH-VFQ operating the inaugural JQ90/91 service. On Monday 30-March-2015 the new JQ164/165 MEL-WLG-MEL service departed Melbourne at the delightful red-eye hour of 00:45 with A320 VH-VQR the lucky aircraft. On Tuesday 31-March-2015 the new JQ125/124 OOL-NAN-OOL service departed Gold Coast with A320 VH-VFJ operating the inaugural return service. With the reabsorption of Virgin Australia (NZ) into the Virgin Australia International arm there have been a number of schedule and flight number changes to the Virgin Australia International network, which came into effect this week, with the winter timetable. Numerous Trans-Tasman, Pacific Island and Bali flights have seen either flight number or time changes or both, here are two changes of note. This once weekly service used to operate PHE-DPS-PHE as VA2611/2613 utilising a Virgin Australia Regional Fokker F100, as of today Saturday 4-April-2015 it is now a DPS-PHE-DPS service using a Virgin Australia International B738 as VA74/73.